"Foremost in the effort of Machon Moreshes Ashkenaz during the last thirty years to research, archive, preserve and disseminate the over-one-thousand-year-old, magnificent heritage of Ashkenaz has been the publication of this monumental series, which researches the evolution of German-Jewish customs and traditions, their development, origins and views surrounding them, in a detailed and clear format. These books have become an invaluable asset for anyone with an interest in Jewish customs in general and German-Jewish customs in particular. 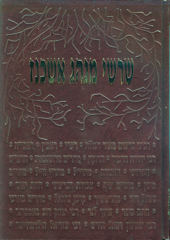 The series is intended to expand to tens of volumes, and currently includes a wide range of topics such as minhagim of tefillah and shul, Shabbos and Yom Tov, marriage customs, yoledes and bris milah, as well as a variety of other minhagim."